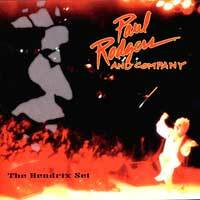 Recorded live at Bayfront Park in Miami, Florida, on July 4, 1993, this odd little EP tribute to Jimi Hendrix features five Hendrix classic as performed by Paul Rodgers (Free, Bad Company, The Firm). Well, sort of. Though Paul is the name on the cover and definitely a rock 'n' roll legend in his own right, only sings. Rather it's Journey guitarist Neal Schon who takes a stab at Jimi's guitar pyrotechnics and does a surprisingly good job at it. Not that Schon is a slacker in anybody's book, but Hendrix definitely has a feel and a style all his own. Schon re-creates Hendrix's guitar tone and riffs fairly faithfully. However, Neal does cut loose and shred a bit too. One of the cooler parts occurs when the band turns "Stone Free" into a medley by shifting briefly and smoothly into Hendrix's "Third Stone from the Sun" while Rodgers sings part of Cream's "I Feel Free." Also along for the ride is bassist Todd Jensen and drummer Deen Castronovo whose drum sound closely copies that of Experience drummer Mitch Mitchell.